The 18-year-old was forced off in last night’s shock Champions League exit at the hands of Ajax, and he has been ruled out for two months. The forward is helped off by Real Madrid's medical team last night. 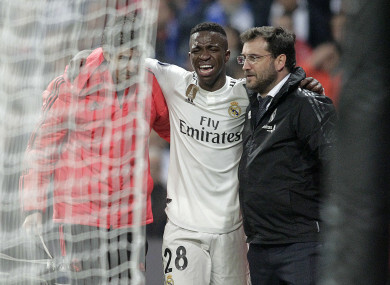 VINICIUS JUNIOR FACES a spell on the sidelines after Real Madrid confirmed the Brazilian teenager has torn ligaments in his right leg. The winger sustained the injury in the first half of Madrid’s Champions League defeat at the hands of Ajax on Tuesday. He was substituted in the 35th minute, with Ajax leading 2-0, and the Eredivisie side went on to win 4-1 and dump the three-time defending champions out in the round of 16. Vinicius has been a rare highlight for Madrid in a terrible season that has seen the club dismiss Julen Lopetegui, with Santiago Solari reportedly close to following suit. He has made 15 La Liga appearances in 2018-19, scoring two goals, while he has also featured in four Champions League matches. Madrid gave no timescale for his recovery in a statement released on Wednesday but reports have suggested he will miss the next two months. After the tests made today to our player Vinicius Jr by the Medical Services of Real Madrid, he has been diagnosed with a torn ligament of the tibiofibular joint of the right leg. Evolution pending,” the statement said. The injury to Vinicius will also come as a blow to his international aspirations, with the 18-year-old having been called up to the Brazil squad for the first time. He was hoping to earn his senior debut for his country in their friendly fixtures against Panama and Czech Republic that are scheduled for March. Madrid head coach Solari, meanwhile, is under severe threat of losing his job, with his side 12 points off the top of the Liga table after Saturday’s 1-0 home Clasico loss to leaders Barcelona. Los Blancos were also knocked out of the Copa del Rey by Barca at the semi-final stage, losing 4-1 on aggregate, although Solari led the team to Club World Cup glory last year. Next up for beleaguered Madrid is an away trip to Real Valladolid on Sunday before they face Celta Vigo at home on March 16. It remains to be seen if Solari will still be in charge by that point, with the likes of Jose Mourinho and Mauricio Pochettino having been linked with the top job at the Bernabeu. Email “Problems deepen for Real Madrid as Brazilian sensation Vinicius Jr to miss rest of the season”. Feedback on “Problems deepen for Real Madrid as Brazilian sensation Vinicius Jr to miss rest of the season”.